Vests on the same constructive basis. A simple and affordable way to upgrade the clothing is the production of jackets. Depending on the purpose they can be lightweight, insulating gasket or lining. 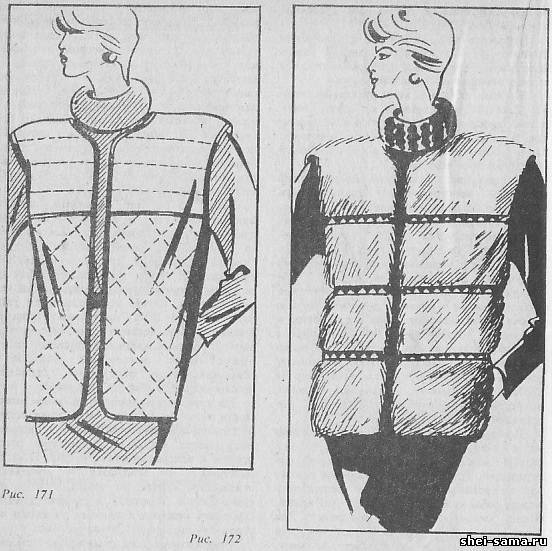 Vests (Fig. 171 to 175) can be manufactured on the same constructive basis . The fabric defines the purpose of a vest: for a service, recreation and sports, for the evening. 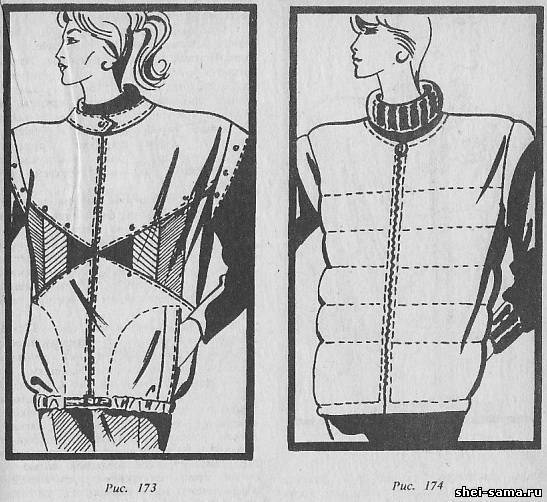 Made from thick fabrics available jacket with insulating padding and lining (Fig. 171). Made the patterns for drawing cut out the top, batting and lining. Lined vest outline lines of stitches and join it with the batting and the top. The details of the shelves and the back (separate top, batting and lining) connect on the side seams and mysterybut the intended lines rare stitches on the machine. Then connect the shoulder seams. The bottom, the side, the neckline and armhole edging finishing cloth, artificial leather and other materials. 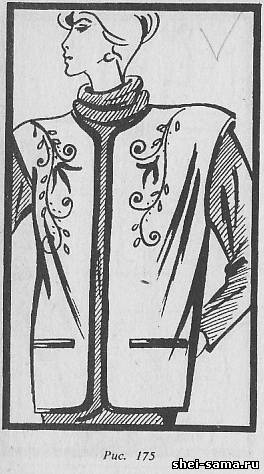 To complete the waistcoat which is shown in figure 172, you can use old fur coats, artificial or natural. The details of the shelves and backs are composed of transverse bands of fur, interconnected finishing braid or leather. A vest can make a lining. To do this, the top and the lining is folded face inward and grind on the bottom, the sides, the neckline and the armholes, leaving open the shoulder seams. The seams of the grinding is attached to the top of the vest. Then through the shoulder seams of the vest there is a turn and straighten. At the end connect the shoulder seams. Of mantle tissue offers youth vest (Fig. 173). Can construct it from smaller pieces, so for this purpose you can use the cloak of any design. Bridging strips on the shelves you can find colored. Details of shelves connect to drawing and they perform pockets with leaflets. Then connect the shelves with the back, the seams are overcast. At the bottom of the garment at the level of the line pocket handle hole for belt bottom buckle on the belt width and zastrugivajut. The zone formed by the inside so the scenes can be replaced with elastic. band (wide band).In armhole stachivaya scoring double bakey-wings. The Board draw up a zip, a neck - collar. Additionally, the vest can be decorated with metal accessories; buttons, eyelets, buckle. Vest in the figure 174, you can sew from Bologna on the batting and lining. The lining is sewn and turned, as in the vest in figure 172. Then the vest is quilted. Armhole draw a stitched welts-wings. The bake is a detail, cut on the bias thread and folded in half, it is embedded inside the insulation (batting). Bake pritachivajut to the armhole hem top - scribbled along the seam grinding openings. The finished vest primetyvajut detachable with a zipper and hook her finishing stitching, stitched on the sides, neckline and bottom. On this constructive basis, it is possible to sew a vest of velvet, if an old dress of velvet cannot be updated without changing the range. It will be an interesting addition to an evening toilet (Fig. 175). It is performed on the lining and make decorative edging of satin fabric or knitted fabric with lurex thread. You can applique satin stitch-embroidery or embroidery thread lurex. The offered jackets can additionally be ground off along the lines of stitches or lines coquettes, if the parts of shelves and back are laid on the parts of the product prepared for shut off.